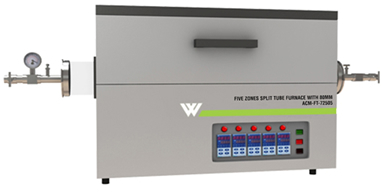 Tube furnaces are designed to carry out various chemical processes under high temperature controlled condition. 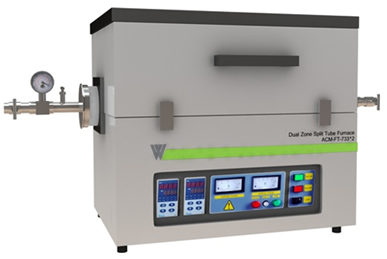 The Tube Furnace facilitates more sophisticated metallurgical applications. 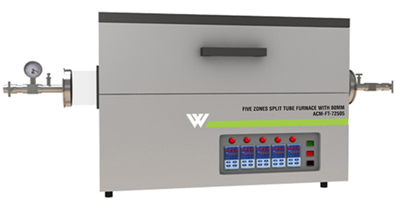 Weiber offers Single Zone to multiple zone Tube furnaces can maintain high temperature value up to 1800°C. In order to increase the throughput and achieve high vacuum, you may replace the standard barbed hose fitting with the KF25 adapter. 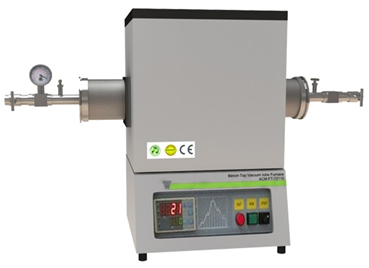 10-2 torr by mechanical vacuum pump. 10-4 torr by molecular pump. OD: 102mm; ID: 92 mm in diameter x 1000 mm length, 99.8% purity alumina tube included. PID automatic control via SCR (Silicon Controlled Rectifier) power control, with 51 steps program. 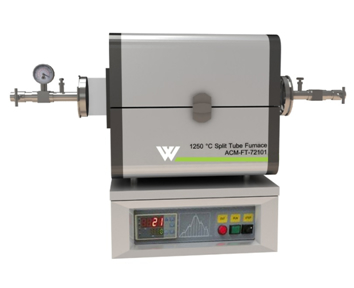 100 mm diameter stainless steel vacuum seal assembling with one vacuum gauge, two valves, and two porous ceramic blocks are included. For fast & better vacuum,we suggest you use KFD25 adaptor and stainless steel pipe , as well as digital vacuum gauge. For supplying high pressure gas, you may replace the standard barbed hose fitting with the VCR Face Seal Fitting. 10 feet length 10-3 AWG heavy duty UL approved power cable is included.Extra length cable can be ordered. PID automatic control via SCR ( Silicon Controlled Rectifier) power control, with 31 steps program. 10 feet length AWG heavy duty UL approved power cable is included.Extra length cable can be ordered. Double wall steel casing with forced air cooling. 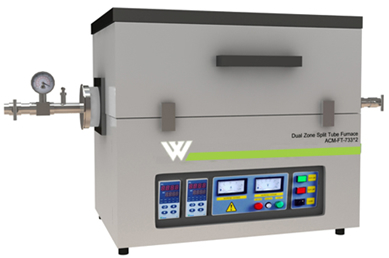 Two heating zone to achieve longer constant temperature zone or a certain temperature gradient. 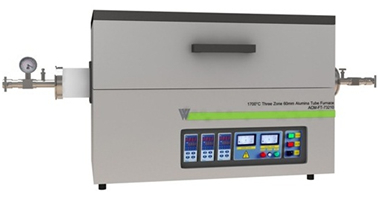 Two precision temperature controller with PID function and 30 segments program. One extra temperature monitor is built in to shutdown power when temperature out of control . Vacuum sealed stainless steel flanges with double high temperature silicon O-ring are included to achieve high vacuum (Usually 10-2torr by mechanical pump and 10-4torr by molecular pump ). Vacuum pump is not included. Right-side flange is hinge-type and KF25 vacuum port. KF25 Vacuum Right-Angle Valve and 1.2 meter long KF-40 Flexible Stainless Steel Vacuum Hose are included. One 1/4" diameter feedthrough port is in built. Left-side flange is installed on slide able table to make movement easy. There are five stainless steel feed though pipes and needle valve installed on the flanges to feed multi-CVD gases. 4 pcs quartz plate is built in left side. Double layer steel case with two cooling fan, which ensure low surface temperature. Energy saving high purity fibrous alumina liner and insulation. AC 208-240V Single Phase, 50/60 Hz , Power cord is included without plug. Quartz block (Optional) is ideal for more cleanliness and higher achievable vacuum. 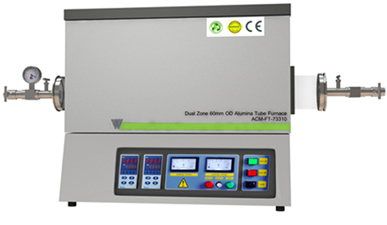 Two Precision Digital Temperature Controller, and each has 30-segement programm with alarm and overheating protection. On one end the flange has a valve, vacuum meter & 1/4" feedthrough attached, and on the other end has a valve & KF-25 Vacuum port. Auto-lift and auto down sample tray. One oil-less vacuum pump is included. Gas inlet port and filter have been installed on the left side of furnace. Double K type thermal couple installed. Right-side flange is hinge-type and KF25 vacuum port. KF25 Vacuum Right-Angle Valve and 1.2 meter long KF-40 Flexible Stainless Steel Vacuum Hose ( Bellows ), are included. Left-side flange is installed on slideable table to make movement easy. There are five stainless steel feed though pipes and needle valve installed on the flanges to feed multi-CVD gases. Max. 25" (625 mm) long with ± 1°C accuracy if set three zones at the same temperature. Precision temperature controllers with 30 segment programm and ±1° C accuracy. AC 208-240V Single Phase, 50/60 Hz (40A breaker required). Powder cord is included without plug. One pair of flange made of SS304, which seals tightly between tubes by two high temperature O-rings (10-2 by mechanical pump and 10-4 by molecular pump). The flange is built with water cooling jacket. 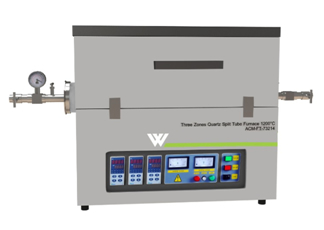 When working temperature > 900°C it is required to use cooling water. One KF25 adapter is installed on left flange to connect to a vacuum pump. 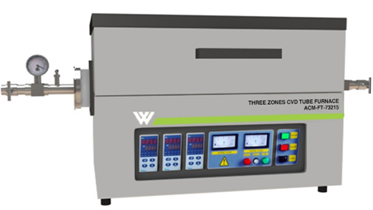 Three independent heating zones via three precision temperature controllers. 30 segments programmable for any temperature profile. Built in protection for overheated and broken thermal couple. Extra length cable can be ordered. Stainless steel pipe (25mmDia x 1000mm length) is included for connecting to tube furnace withKFD25 adaptor and clamps. Optional: in order to control gas delivery accurately, you may choose three channel gas delivery system controlled by precision digital mass flow meter at extra cost. Double layer steel case with two cooling fan, which ensure low surface temperature.Energy saving high purity fibrous alumina insulation. Two fibrous ceramic tube blocks are included for blocking heat radiation from inside tube. Quartz block is ideal for more cleanliness and higher achievable vacuum. In order to increase the throughput and achieve high vacuum, you may replace the standard barbed hose fitting with the KF25 adapter, please specify at time of order. For supplying high pressure gas, you may replace the standard barbed hose fitting with the VCR Face Seal Fitting, please specify at time of order. Digital Controllers, and each has 30-segement program.